Despite the hype about disruption, the truth is most tech giants, particularly platform providers, are not so much displaced as they are eclipsed. IBM, for example, has been successfully selling and servicing mainframes for going on 50 years (although they are now in serious trouble (members-only)). 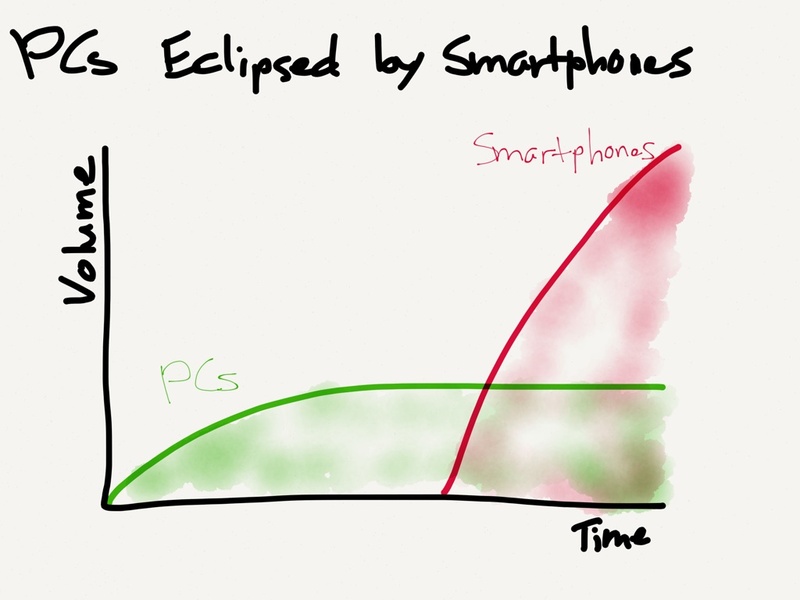 During the PC era, though, they were eclipsed by Microsoft. The same happened to Microsoft: Windows still dominates PCs,1 and in all likelihood will for the foreseeable future (although there are certainly cracks in the foundation, a la IBM). The company isn’t going anywhere. PCs, however, have been eclipsed by smartphones, to the benefit of Apple (in terms of revenue and profit) and Google (in terms of market share). These eclipses are obvious in retrospect, but the truth is few if any could have predicted them before they occurred. PCs were thought to be a tremendous boon for IBM, and they did profit greatly until Compaq copied their BIOS leaving Microsoft all the leverage; similarly, Microsoft looked set to conquer mobile (which was why Google bought Android in the first place) before a resurgent Apple introduced the iPhone. In both cases it turned out that the incumbents’ prior success resulted in misdirected incentives: IBM focused on selling and servicing PCs, instead of building a platform, while Microsoft focused on extending Windows to mobile instead of the user experience. If you’ll forgive a war analogy, both companies won the battle but lost the war. And so, if one wishes to predict who might follow in this illustrious but ultimately tarnished path, it might be useful to look for similar characteristics: the company should be dominant in its field, and the company should seem to have an advantage in a far larger adjacent field, but that advantage, on closer inspection, should prove to be just as much a hindrance as a help. The clear candidate is Google. Search represents the largest digital advertising market — almost $50 billion last year globally, according to PwC, compared to just $34 billion for display ads — and is growing roughly 10% a year. But Google so thoroughly dominates the search industry that few are even bothering to challenge it anymore. Frommer goes on to list potential challengers to Google’s dominance, but the outcome is clear: Google will continue to dominate, just as IBM has continued to dominate mainframes and Microsoft has continued to dominate the PC. They will be a very profitable company for many years to come. That is why this is not an article about disruption. Rather, the question is if Google might be eclipsed. $50 billion for worldwide search advertising (of which Google captures a huge majority) sounds like a lot, but it’s only a small percentage of total ad spend, projected to be $545 billion in 2014. The vast majority of that spend is not about direct response – i.e. ads that spur you to make a purchase on the spot; rather most of the money is spent on brand advertising. The idea behind brand advertising is to build “affinity” among potential customers. For example, a company like Unilever will spend a lot of money to promote Axe or Dove, but the intent is not to make you order deodorant via e-commerce. Rather, when you’re rushing through the supermarket and just need to grab something, the idea is that you’ll gravitate to the brand you have developed an affinity for. And once a customer has picked a brand, they’re loyal for years. That adds up to a lot of lifetime value, which is why consumer-packaged goods companies, telecom companies, car companies, etc. are among the biggest brand advertisers (I’ve written about CPG companies and brand advertising previously here). To date this type of brand advertising has strongly favored television; targeting is certainly nice, but channels like Lifetime (Dove) or ESPN (Axe) are specific enough, and the actual process of implementing a campaign at scale is far more efficient and cost effective on TV. This is especially true given that the primary digital offering for brand advertisers has been the banner ad, an idea that was bad to begin with and that now is all but invisible, particularly to younger customers that have by far the most value to brand advertisers (more years in the actuary table equals more lifetime value!). 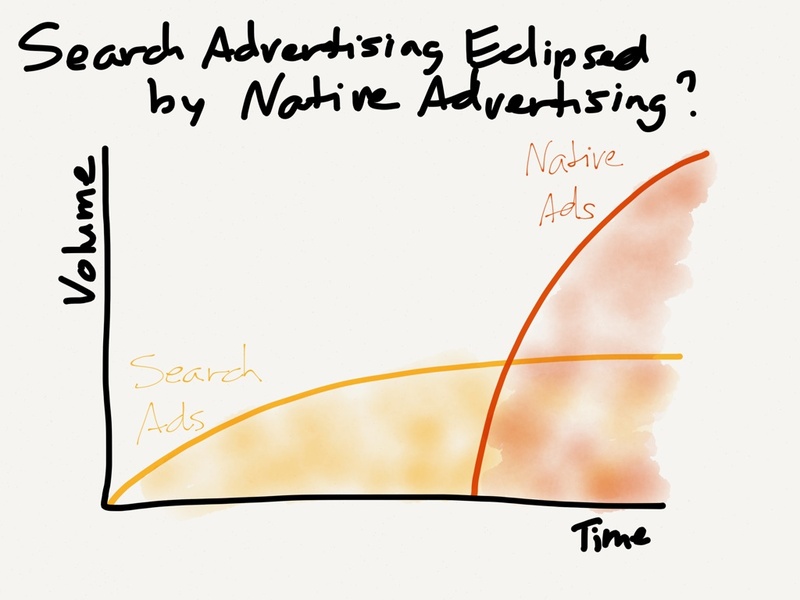 However, over the last few years a new type of advertising has emerged: native advertising. I’ve already made my defense of native advertising here, but just to be clear, I classify any sort of “in-stream” advertising as native advertising. Thus, for a news site, native advertising is advertising in article format; for Twitter, native advertising is a promoted tweet; for Facebook, native advertising is ads in your news feed; for Pinterest (a future giant) a promoted pin. These sorts of ads are proving to be massively more effective and engaging than banner advertisements – as they should be! In every medium (except, arguably, newspapers, which had geographic monopolies) native advertising is the norm simply because it’s more effective for advertisers and a better experience for users: TV commercials are 30 or 60 second fully produced dramas, magazine ads are highly refined visual experiences, radio ads are jingles, etc. And so it will inevitably go with digital advertising, at least when it comes to brand advertising. The problem for Google is that there is no obvious reason why they should win this category. Yes, they’re an ad company, but the key to native advertising on the Internet is the capability of producing immersive content within which to place the ad, such as Facebook’s newsfeed, Twitter’s stream, a Pinterest board, or even your typical news site’s home page. Sites like Buzzfeed have taken this idea to its logical conclusion: their content is basically a marketing tool meant to show advertisers how skilled they are at going viral. Google has nothing in this regard.2 Moreover, all of the things that make Google great at search and search advertising – the algorithm, the auction system, and machine learning – are skills that don’t really translate to the more touchy-feely qualities that make a social service or content site compelling. And so we have our parallel to IBM and Microsoft. 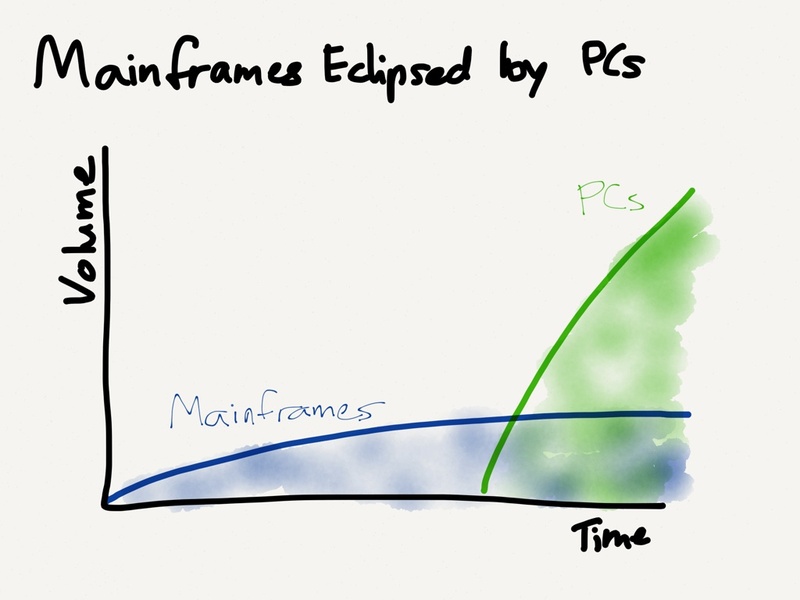 IBM didn’t capitalize on PCs because their skills lay on the hardware side, not software. Microsoft didn’t capitalize on mobile because they emphasized compatibility, not the user experience. And now Google is dominant when it comes to the algorithm, but lacks the human touch needed for social or viral content. And so, when all of that brand advertising finally begins to move from TV to the Internet – and that migration is a lot closer than it was even a year ago – I suspect that Google is not going to capture nearly as much of it as many observers might expect. This is the primary basis of my thesis that Google may very well be in a similar situation to early-eighties IBM or early-oughts Microsoft: a hugely profitable company bestride the tech industry that at the moment seems infallible, but that history will show to have peaked in dominance and relevancy. I do write this article with some trepidation; it’s a lot easier to be a cheerleader, and from a business perspective I’m a big fan of Google’s. They have earned every point of share they have in search, and Android was a brilliant strategic gambit to protect the money makers. Moreover, these sorts of predictions are almost always losers: you’re always wrong until the moment when you’re right, with all the attendant loss of credibility that entails. Still, I hope the subtle point I’m trying to make is clear: I think Google is quite safe when it comes to search, and that they will be a very profitable company for the foreseeable future. I just suspect we will all think differently about that dominance when it’s a small percentage of total digital advertising, just as we thought differently about IBM’s dominance of mainframes in the age of the PC, or Microsoft’s dominance of PCs in the age of the smartphone. Finally, as I noted at the beginning, this is not about the decline of Google. It’s about there being a much broader opportunity than just search advertising.